Park Sands Beach Resort is a quiet, family oriented R.V. 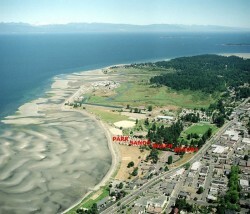 park, situated on the sandy shores of Parksville Bay, on the central, east coast of Vancouver Island. Families have been coming to Parksville, and to Park Sands, for generations, to enjoy what many say is one of the best vacation beaches in Canada. Kids love the Community Park next door, with its extensive playground, waterspray park and skateboard/BMX park. There are also tennis courts, horseshoe pits and ball fields to enjoy. Golf (7 courses), fishing, and miles of hiking and bicycle trails — are all close by! Located close to all amenities in downtown Parksville, Park Sands has 94 RV sites, 40 with concrete pads. Full & partial hookups are available featuring 50, 30 or 15 amp service & cable TV. We can accommodate RVs up to 45 feet in length. Our beachfront sites offer fabulous views of Georgia Strait, with it’s necklace of islands and the surrounding mountains of the Coast Range – summer sunsets over the strait are spectacular. Further back from the beach, sites set amongst majestic old fir trees and maples provide welcoming shade. Our washrooms, with flush toilets, and coin operated showers, are open from Apr. 15 – Sept. 30. Our coin operated laundry is open year round.